Hylocereus undatus (Red Pitaya, Dragonfruit), the uniquely flamboyant cactus! What a stunning beauty, most deserving to be named ‘Belle of the Night’. 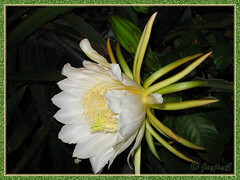 John and I felt blessed indeed to have enjoyed the rare appearance of two flowers one lovely night more than a year ago on the Hylocereus undatus that is planted by our neighbour. Housed in a large container and located outside between both our homes, it climbs skywards to almost 6 m, using the street lamp post for support. We’ve seen it bearing occasional fruits but that was our first time seeing its scented blooms that are known to flower only at night and that too, will last for only 1 night. We would have missed the golden opportunity then, had we not ventured out earlier in the evening to attend the Sunset Mass Celebration and returned home after dining out. Truly remarkable…what perfect timing! 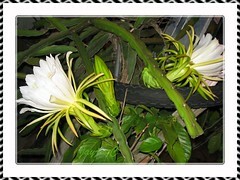 Dragon Fruit’s sparkling white flowers are magnificent and huge, about 20 cm wide x 30 cm long and in beautiful contrast against the darkness of the night. Nonetheless, it is the exotic edible fruits that we enjoy most…mildly sweet with a blending taste of a pear and kiwi, juicy and so refreshing when eaten chilled on a hot day, and wonderfully packed with vital nutrients for good health. 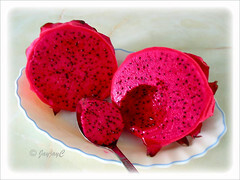 Fortunately for us, Malaysians, our country has joined the band wagon for about a decade since, in commercially cultivating and producing the fabulous Dragon Fruit or Red Pitaya locally, both the white- and red-flesh species. Hence, prices are reasonable, making it affordable to one and all, as compared to the exorbitant prices on imported ones from Vietnam and elsewhere when it was first introduced here. Too bad, our garden is too small to accommodate this lovely fruit-bearing vining cactus. Otherwise, it can be an eye-catching ornamental plant addition, with its magnificent flowers and enticing fruits that are not only uniquely beautiful in color and shape, but will provide a steady supply of fruits for the table. 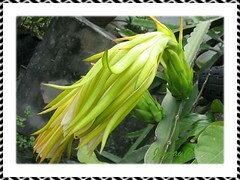 This flamboyant cactus plant, together with the flowers and fruits is simply unique, exotic and dramatic! A must have for those who love the unusual! Features: Hylocereus undatus is one of the most popular and cultivated cacti species of the genus Hylocereus, especially for the fruit industry. Vietnam is the largest producer and exporter of this species that was introduced in that country by the French in 1870. Besides being favourably cultivated for the fruit industry, it can be home-grown as an ornamental and fruit-bearing vine for the garden. 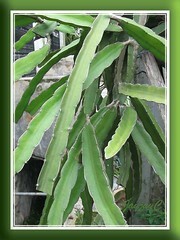 A perennial vine-like cactus that’s fast growing and can be planted in large containers or ground-grown. To climb, the plant needs to be supported on trees, trellises, wooden or concrete posts, metal rods and other similar frame and can reach extreme heights up to 9 m or more, attaching itself with aerial roots if left unchecked. It bears deep green stems that are fleshy and usually triangular, with undulated margins on the rib and clusters of fine spines sparsely seen on adult branches. Scandent stems with many side branches (30-120 cm long or more) sprawl in a disorderly fashion. It produces cactus-like flowers that are absolutely striking and gorgeous. They’re sweetly scented with snowy white petals cupping numerous golden stamens, and surrounded with lemon-green to green outer tepals/bracts. They’re huge and impressive, about 20 cm wide and 25-30 cm long. Aptly known by another of its common name, Night Blooming Cereus, it blooms only at night and normally last for the duration of that night only, during which pollination by bats, moths and other insects is required to set fruits. By morning, it becomes limp and unappealing. Hand pollination may be necessary if not done by insects. It is said that cross pollinating of H. undatus and H. polyrhizus (red flesh species) can encourage more prolific fruiting and larger-sized fruits. If successfully pollinated, flowers will set fruits that should mature and ripen about 30-40 days after flowering. Fully ripened fruits, ranging from medium-sized to large and weighing between 300-700 gm or more, are oblong to ovoid. Fruit’s skin of H. undatus is attractively coloured pinkish-red and has prominent fin-like bracteoles. Enclosed inside the thin rind is the semi-sweetened white pulp, dotted with tiny edible black seeds that are delightfully relished by many. These are the seeds used for propagating new plants. Healthy Red Pitaya plants can have between 4-6 fruiting cycles per year. Culture (Care): Dragon Fruit can be easily cultivated and maintained, growing best in dry and hot tropical or subtropical regions with annual rainfall from 600-1300 mm and a maximum temperature of 30-40 degrees C.
Light: Full sun to partial shade. Provide shade when necessary, especially if sun exposure is too intense. Moisture: Little water is required as plant has succulent stems, but water sufficiently in extremely dry and hot seasons. Do not overwater or allow soil to be water-logged, which can cause root rot and kill the plant. Soil: Grows best in rich organic soil (with added organic material like manure compost) and a mix of sand that can retain water, yet porous. Nevertheless, it’s known to grow successfully in sandy soils too. Others: Ensure that the trellis or whatever structure that supports the Dragonfruit cactus is sufficiently strong as the plant’s stem/branches and fruits are heavy. Since it grows somewhat aggressively and haphazardly, it is recommended to regularly prune the vining cactus to maintain size and shape like a short tree (ideally 2 m tall) with a single long stem or trunk and many branches. Shaping this way, not only enhances its beauty aesthetically, but make it easier to harvest the fruits, as well as reduces congestion and allow light penetration and improve aeration, thus preventing potential rot and bacterial disease. Tip pruning will induce stem branching and blooming, thus increasing fruit yield. Moreover, the prunings from matured, robust and productive plants can be used as cuttings to propagate new plants. Low nitrogen fertilizer is recommended once monthly for flowering and fruiting or use organic compost regularly throughout the year. For subtropical regions: Hardiness: USDA Zone 10a-11. It will tolerate tempature up to 40 degreas C and short periods of frost, but prolonged cold will damage or kill the plant. Should not be kept below 10 degrees C in winter. Propagation: By seed, or by stem cuttings, the later being the easier and faster method. Most plants propagated by stem cuttings taken from a robust, matured and productive parent plant can produce fruits within 9 months. 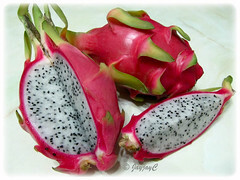 Read more on how-to grow Dragon Fruits from seeds here and by stem cuttings here. Usage: Ideal as an ornamental vine on trellises, pillars, poles, chainlink fences or over garden walls and other similar structures. 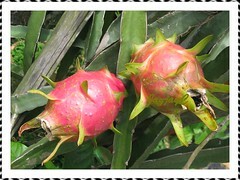 Growing Dragon Fruit present a double-bonus, with unusual beauty to enjoy and fruits to relish. Their fruits are popularly eaten chilled, out of hand or spooned out from cut-halves or whatever manner as the flesh is easily separated from the skin. Excellent too as an addition in fruit salads or for juicing with other fruits, sherbets, flavoring drinks, set on cakes, jellies and desserts, as well as processed into cordial, jam, wine, dried fruits and other products. Its skin can be processed as a natural food colouring. In some regions, the young shoots and unopened flowerbuds are cooked and eaten as vegetables. Besides, Dragonfruit is rich in vitamin C (dried fruits has 10x that of fresh ones), fiber, antioxidants and loads of other valuable nutrients. 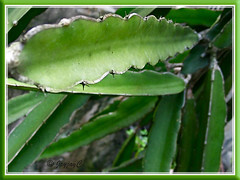 It is reputed to have medicinal uses, namely, improve eyesight, aids digestion, prevent hypertension, control levels of glucose blood sugar in type 2 diabetes, treat stomach and endocrine problems and others. 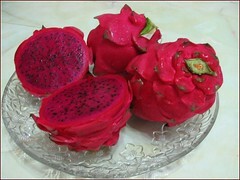 More health benefits of Dragonfruit at HubPages. Hylocereus polyrhizus – has crimson-red skin and dark-red flesh that is much sweeter than H. undatus. Selenicereus megalanthus (Yellow Dragon Fruit) – has yellow thorny skin and white flesh that is said to be the sweetest and tastiest of all the dragon fruits. 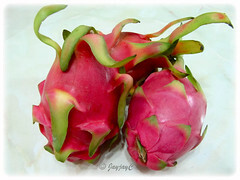 Besides these, there are other Dragon Fruit hybrids and varieties whose fruits are clothed in various exotic colored-skin of differing intensity, sizes and shapes. Even the flesh or pulp come in varying hues of white, pink, magenta and deep purplish. 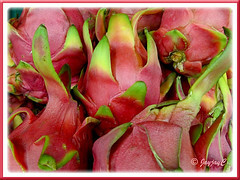 Do enjoy the many varieties of dragon fruit presented at Pine Island Nursery’s photo gallery. Thunbergia laurifolia: beautiful, beneficial and beastly! Clitoria ternatea (Butterfly Pea), a striking and versatile vine! Jacqueline, I am quite confused here. 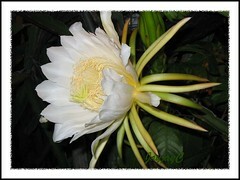 I thought the night blooming cereus is the ‘keng fah’, which is different from the dragon fruit. 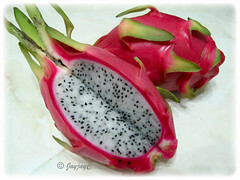 I have seen the dragon fruit flower on the web and it looks quite similar. I have been looking for a seedling to grow the keng fah because this was my late dad’s favourite flower. Do you know where I can find it? Wonderful photos! My night blooming cereus is an Epiphyllum with very similar blooms, but the leaves and stem are different. I’ve never had fruit to follow the blossoms, probably because my zone 8b conditions are not what it needed to produce fruit. The blooms have an incredibly wonderful fragrance. Re ‘Keng fah’, I’m not familiar with that plant though…sorry. Nell Jean – thanks for dropping by and kind comments. Wow, must be wonderful to enjoy your fragrant blooms…probably you can share a pic or two when they bloom the next time, I’d love that very much! I’ve seen some online Epiphyllum images which show them to be quite colorful. Vining cactus? This is the first time I see it! I saw the pictures of its blooms, but never – fruit. They are beautiful and yes, very exotic! It’s an excellent post Jacqueline, with a lot of information and great pictures! Thank you! Have a happy Holiday Season! Thanks for your uplifting compliments and wishes, Tatyana! Happy holidays to you too! 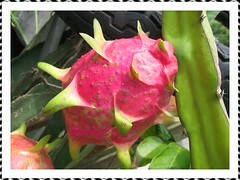 Very interesting and informative, this is the first time I see the flower of the dragon fruit, very beautiful and magnificent. Wonderful to see you here, Rose. Really appreciate your visit and sweet compliments. Thanks. When I first saw this I thought it was an orchid cactus but later when I checked again they are two different plants. Though both are night blooming flowers. 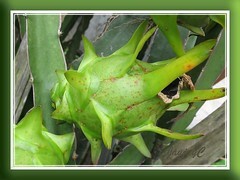 Epphyllums have flat leaves but the dragonfruit have this compressed triangular shaped vines. Indeed, James. 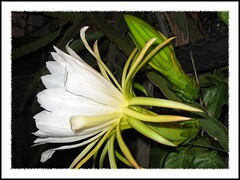 I was recently introduced by Nell Jean to the Epiphyllum blossoms, also known as Night Blooming Cereus! She has gorgeous captures of them at her blog, if you’re interested! Thanks for visiting and sharing your thoughts. Hi Jacqueline, I have inherited some dragon fruit plants after my mom passed away. I found the stems are rather yellow and some have very unhealthy look. I got from fruit last year, but have not seen flowers this year. Could you give me some tips about how to keep the stems greens and spotless like the picture you have here? I posted my plant photo on facebook. Hope you can take a look. Thanks. 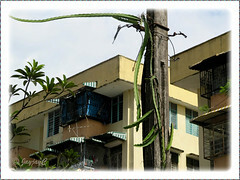 I have a dragon fruit plant that has 3 very long shoot that have attached themselves to the side of my house. I would like to remove them but save the plant, what is the best way to do so? Hi Anastasia! 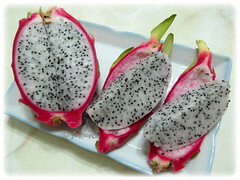 You may probably want to explore the site at dragonfruit.Foodlywise to know more.